Is your favorite pair of leggings completely worn out? On the hunt for a new go-to pair? Then have we got the giveaway for you! 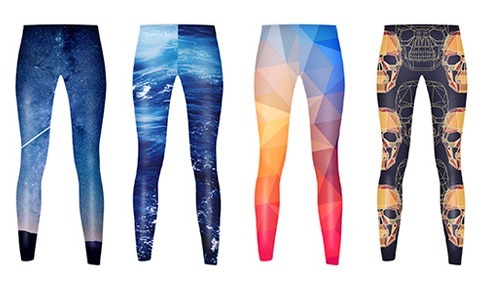 Hot off the presses in the DOYOUYOGA STORE, we have tons of awesome leggings, all looking for a new home. So this week, we're giving away a pair of leggings of your choice to three lucky winners. Simple — just leave a comment below! Our signature DOYOUYOGA leggings are durable for even the most strenuous yoga practice. Made with love in California, they're sweatshop free, so you can feel extra good wearing them. Made from polyester and spandex, they're guaranteed to fit you just the way you like. Choose from any design that suits your fancy: whether you're hitting the mat or the town, DOYOUYOGA leggings will go with whatever outfit you choose. Three (3) randomly selected users will be chosen to win one (1) pair of leggings of their choice. The giveaway runs from January 11, 2016, to Friday, January 15, 2016, so make sure to comment below to enter! And until then, check out all the designs and other cool yoga gear in the DOYOUYOGA STORE. Can't wait for the giveaway to be over to get your own pair? Shop now on the DOYOUYOGA STORE and get free shipping worldwide this week, as well as 20% off your leggings! This giveaway is now closed. Thank you to everyone for participating. Congratulations to the three winners, @gliljeberg, @eilvvn, and @radtechandrea! If you didn't win, make sure to head over to the DOYOUYOGA STORE where you can get your own pair of DOYOUYOGA leggings at 20% off and with free worldwide shipping for the rest of the week!